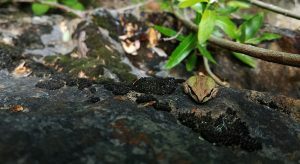 Even though it has ‘tree’ in its name, the Sierran Tree Frog is mostly found near the ground. Tree frogs live in bushes and grass. Their preference is for damp, moist areas. Large toe pads that allow it to walk on vertical surfaces. The toe pads are also useful for clinging to sticks and twigs. 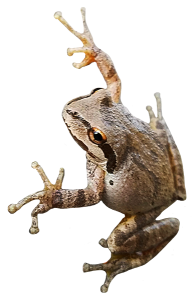 To avoid being eaten, the Sierran Tree Frog is fast! It can jump long distances and swim quickly to hide. It also remains perfectly still and changes color to stay camouflaged. Sierran Tree Frogs can change from green and gray to brown. Worms, small invertebrates, and flying insects are the frog’s dietary staples. Tadpoles feed on algae, bacteria and organic debris. Their feeding activities help keep streams and waterways clear of slippery plant material. Speak up for Nevada County frogs, toads, and salamanders.